Dr. Charles Yoo is a renowned radiologist in Palm Springs, California. He received his medical diploma from Perelman School of Medicine at the University of Pennsylvania in 1998. 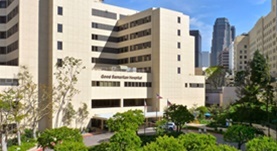 Dr. Yoo completed his medical education with a residency in internal medicine at VA Greater Los Angeles Healthcare System and a residency in radiology at Massachusetts General Hospital. He is certified by the American Board in diagnostic radiology and neuroradiology. His subspecialty is general radiology. Doctor Yoo works at the moment at Desert Regional Hospital.